Following a strong debut from Insidious Chapter 2 last weekend, the post-summer market gets an infusion of adult-oriented drama with Prisoners on Friday. Sony's Battle of the Year also debuts. 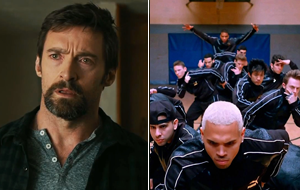 - The ensemble star power of Hugh Jackman, Jake Gyllenhaal, Viola Davis, and Melissa Leo. - Aside from the success of The Butler, adult moviegoers haven't had much to bring them out to theaters since before summer. - Facebook and Flixster activity for the drama have been considerably strong. - Awards buzz, particularly for Jackman, could give the film a boost. - Opening near the end of September likely means a run more about legs than a big opening weekend. - Twitter activity has left something to be desired in comparison to last year's End of Watch. - On their own, most of the ensemble cast aren't known as major box office draws. - Similarly-themed dance pics have found their share of success in the past (namely the Step Up franchise). - This could be a viable option for teenage crowds this week--assuming they've had enough of Insidious Chapter 2. - Buzz across all forms of social media is virtually non-existent. - The dance pic craze seems to have burnt out. - The lack of any star power and low theater count will further prevent a breakout. Check out our forecast for these openers and the remainder of the weekend's top 10 in the table below. The Wizard of Oz 3D Sep 20, 2013 Warner Bros.